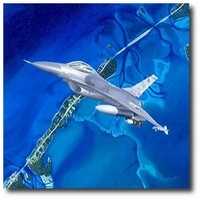 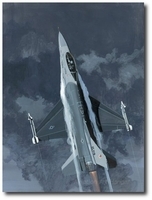 In an air combat role, the F-16 Falcon's maneuverability and combat radius exceed that of all potential threat fighter aircraft. 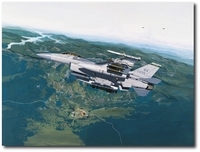 It can locate targets in all weather conditions and detect low flying aircraft in radar ground clutter. 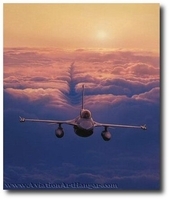 In an air-to-surface role, the F-16 can fly more than 500 miles (860 kilometers), deliver its weapons with superior accuracy, defend itself against enemy aircraft, and return to its starting point. 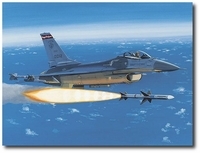 An all-weather capability allows it to accurately deliver ordnance during non-visual bombing conditions. 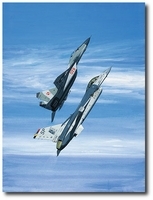 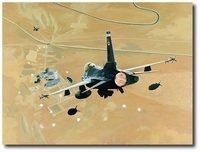 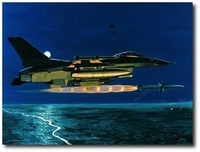 "Lightning Strike & Viper Venom"
"Magnum - Operation Allied Force"
"Payback Time in the KTO"